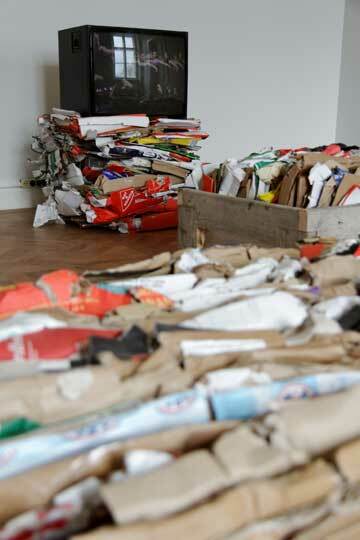 Manifesta is a project born in the heady aftermath of the fall of the Berlin Wall. 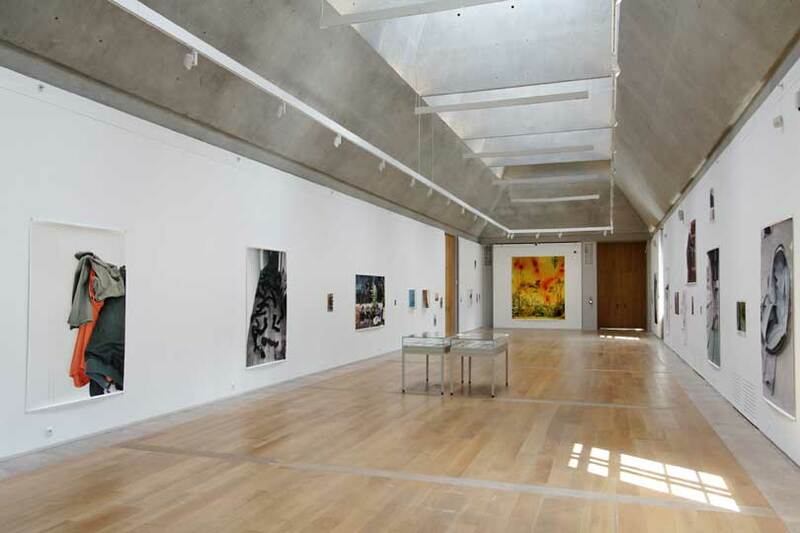 It is a travelling biennial of contemporary art, which sets up camp in a different European location every two years. Its ambition, in the words of its director, Hedwig Fijen, is to ‘open up new channels of artistic, cultural and political life’, not solely in parts of Europe once behind the Iron Curtain but also in parts of Europe distant from its cultural capitals. Harnessing the idealism of young curators and the creative energy of young artists, Manifesta offers the host city an approximately 100-day performance of what contemporary art can be and do. It has appeared in very different forms in Rotterdam (1996), Ljubljana (2000), in the Italian region of Trentino-Alto Adige (2008) and in the defunct mine of Waterschei in Genk, in the former coal-mining region of Belgian Limburg (2012). This year, controversially, Manifesta has broken the mould. 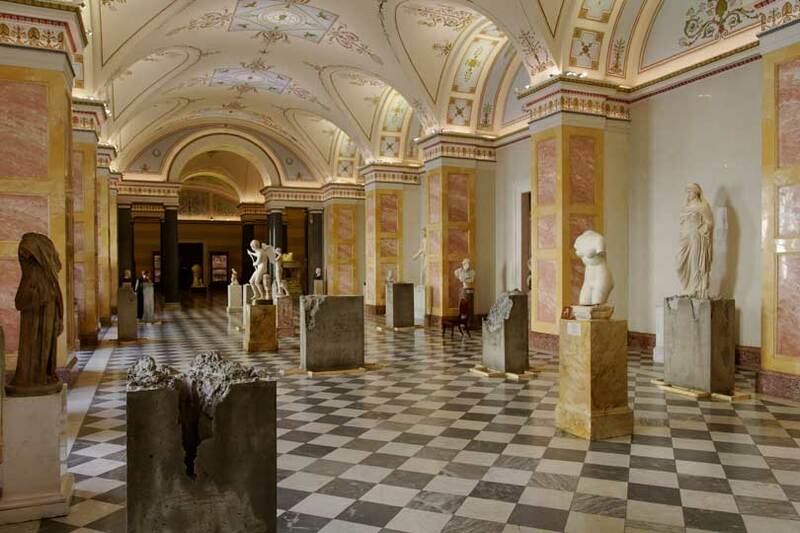 Jumping outside Europe, it has set up shop inside the Hermitage, Russia’s legendary universal museum, 250 years old this year, with collateral programmes spilling into galleries and other venues in St Petersburg. 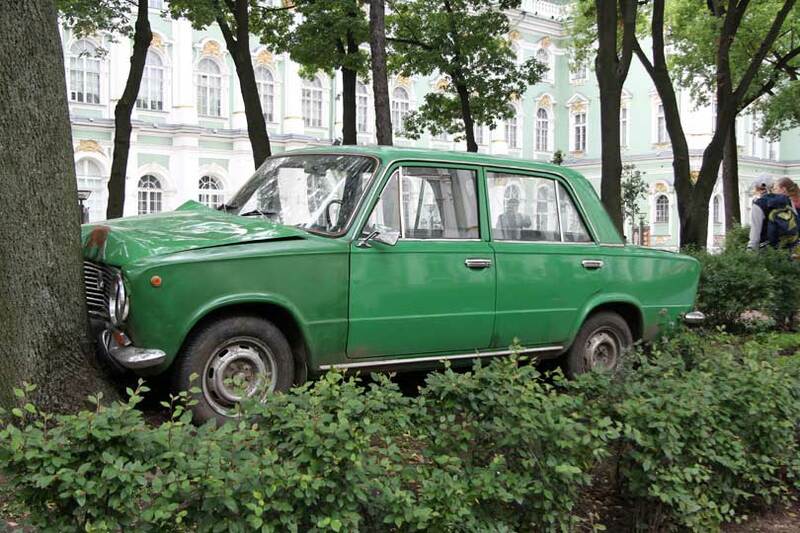 Russia has always played a tangential role in Manifesta – after all, the biennial was inspired by the breaking up of the USSR and in opposition to the cultural repression that the Soviet Union had represented. 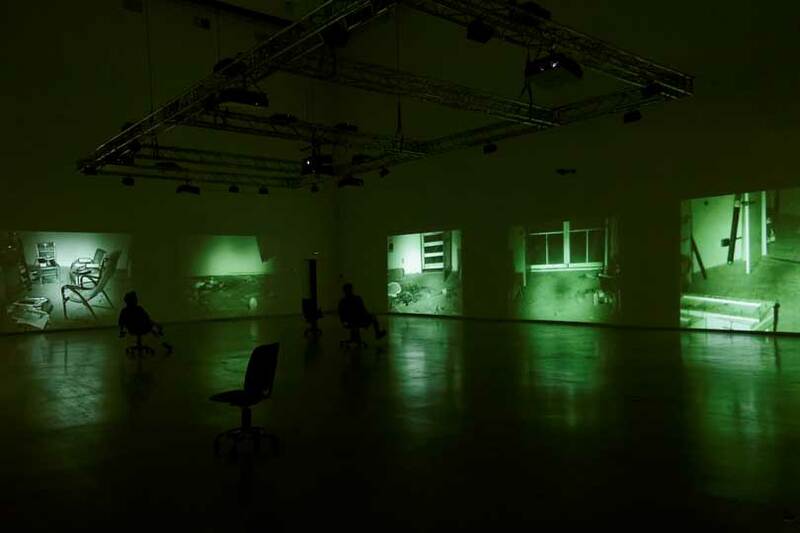 Viktor Misiano, then Director of the newly formed Moscow Center for Contemporary Art, was invited to be part of the first curatorial team in 1995. Today he is chair of the Manifesta Foundation. Moreover, from the start many Russian and Ukrainian artists were invited to participate. However, to move into the jaws of the great bear itself has seemed to many a step too far. And as Vladimir Putin has cracked down on dissent, annexed the Crimea and ratcheted up aggression against the Ukraine, many have challenged the decision of Manifesta to offer the olive branch of art to this currently increasingly authoritarian state. There have been boycotts by artists and critics. Even a couple of weeks before the show opened it was still in doubt whether it would go ahead, so difficult did the artists and curators find it to negotiate Russia’s slow-moving bureaucracy. Yet in the end all those responsible – Kasper König, the distinguished German curator and director of the Museum Ludwig in Cologne, invited to be lead curator; Mikhail Piotrovsky, Director of the State Hermitage Museum, responsible for inviting the exhibition to the Hermitage; the artists; the curators of parallel and public programmes and Fijen herself – have kept faith with the project and brought the show to fruition. It opened at the end of last month in St Petersburg and runs until 31 October. 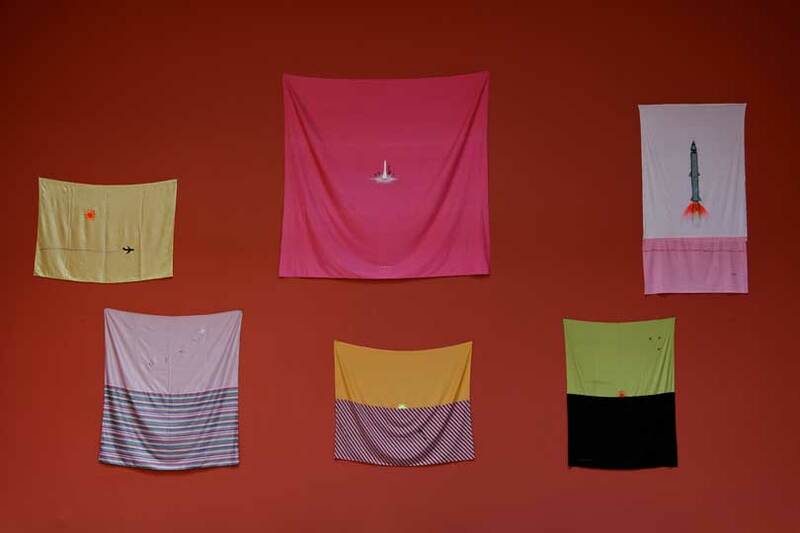 The Basement (2014), Erik van Lieshout Courtesy Annet Gelink Gallery, Amsterdam. Commissioned by MANIFESTA 10 St Petersburg. With global politics so dominant in the conversation surrounding Manifesta, there was a danger the art might become an irrelevant sideshow. In the event, König and Piotrovsky have steered a careful course. The former has chosen artists of stature and subtlety, able to negotiate their own relationship with the Hermitage’s architecture and collections – from Francis Alÿs, who drove a Lada from Belgium to the Winter Palace, where he crashed into a tree, to Erik van Lieshout, who has made a project about the cats in the Hermitage basement. The latter emphasises the Hermitage’s role in protecting and exhibiting contemporary art, from Catherine the Great, through to the exhibition of the Chapman brothers (October 2012–January 2013). 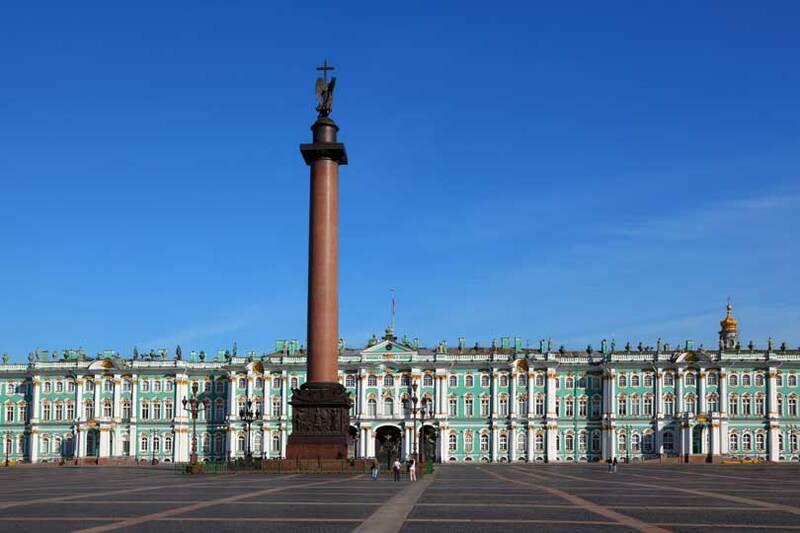 Manifesta coincides with the launch of the Hermitage’s renovated modern and contemporary wing in the former General Staff Building opposite the Winter Palace. In the new top floor galleries, two rooms have been given to the wonderful, revolutionary Matisse paintings collected by Sergei Shchukin and Ivan Morozov at the turn of the last century. 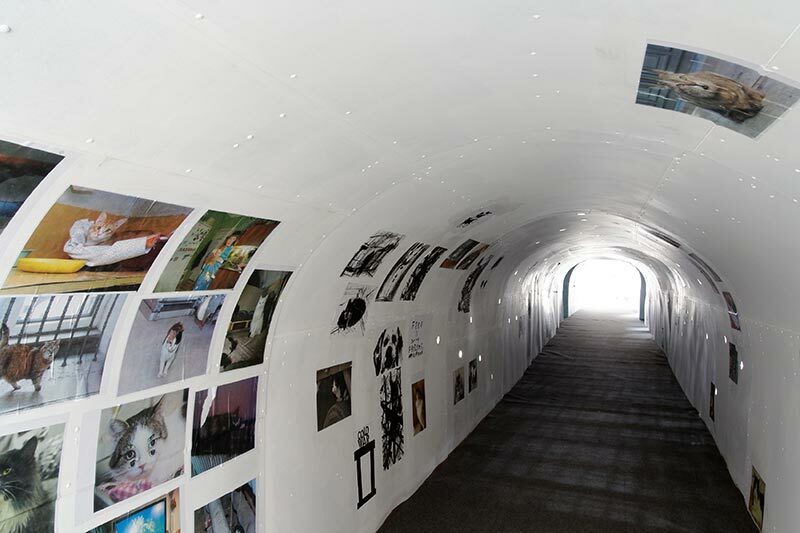 These introduce the rooms of artists invited by König – for instance, Klara Lidén, Bruce Nauman, Rineke Dijkstra, Wolfgang Tillmans, the Muscovites Pavel Pepperstein and Alexandra Sukhareva – alongside the romantic defiance of Vladislav Mamyshev-Monroe, and humane images takes by Ukrainian Boris Mikhailov of the protests last winter in Kiev’s Maidan Nezalezhnosti. On the ground floor, where huge new doors and a glass roof have created vast spaces between two original sets of buildings, a series of iconic pieces show us how art can be made politically even if it is not overtly political. Ilya Kabakov’s iconic Red Wagon, owned by the Hermitage, which dramatises in three stages the vain hope, smothering containment and despair of the Soviet dream, is followed by a room full of textiles by the 1990s hero of Russian art, Timur Novikov, finding imaginative freedom through the simplest means. 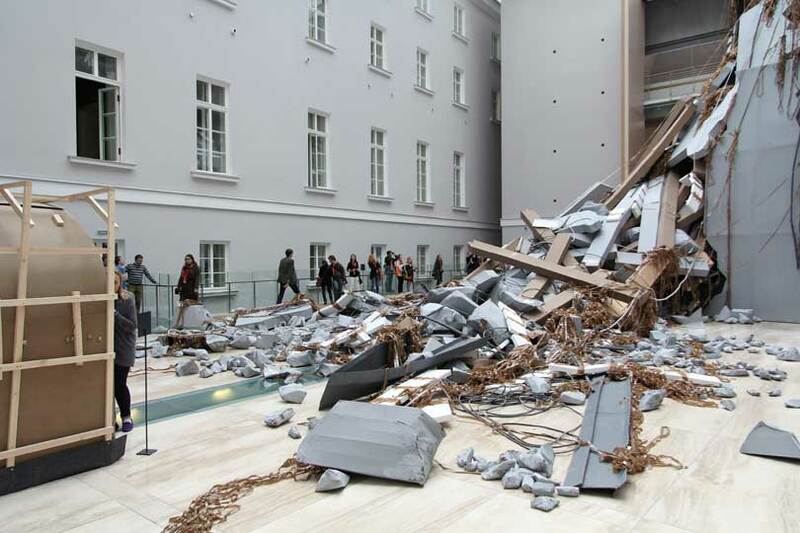 Perhaps the star piece here however is the specially commissioned installation by Thomas Hirschhorn, epic in scale, entitled Abschlag (reduction). 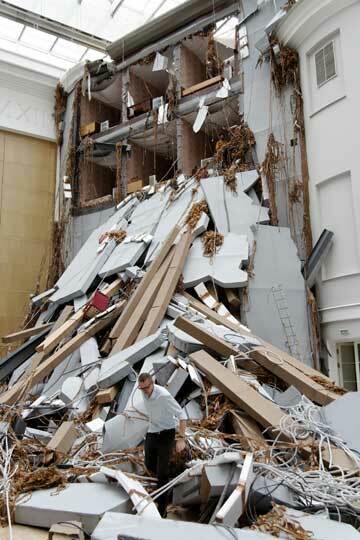 This is a construction from cardboard and other materials of an entire building in the process of demolition, with six rooms exposed complete with shabby beds, desks, radiators, and all the debris scattered. The structure is parcel taped onto the newly conserved interiors of the General Staff Building, in rebuke of their smooth facades. 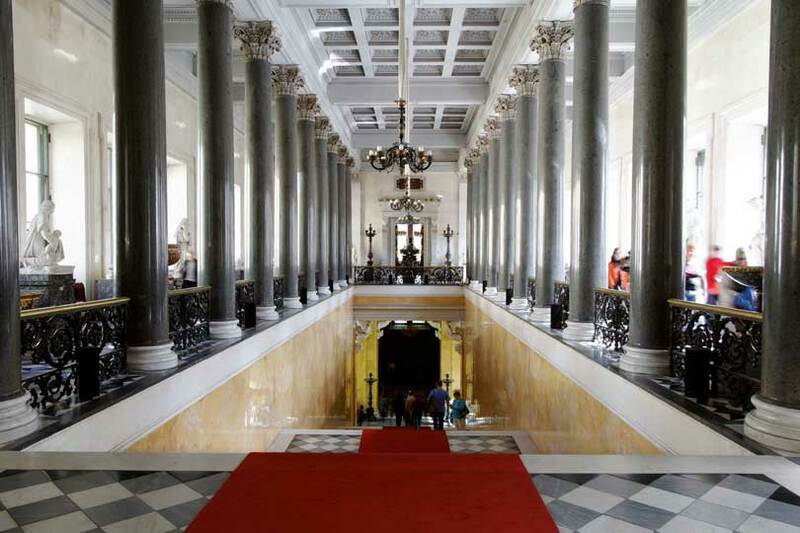 Within the Hermitage itself, highlights include Susan Philipsz’s eerie musical animation of the main staircase of the New Hermitage, Lara Favoretto’s concrete plinths in rooms dedicated to ancient Greek sculpture, Marlene Dumas’s series of portraits of gay Russian heroes – including Tchaikovsky, Sergei Diaghilev and the political journalist and gay rights activist Anton Krasovsky – and Katharina Fritsch’s witty life-sized shell lady and dog. 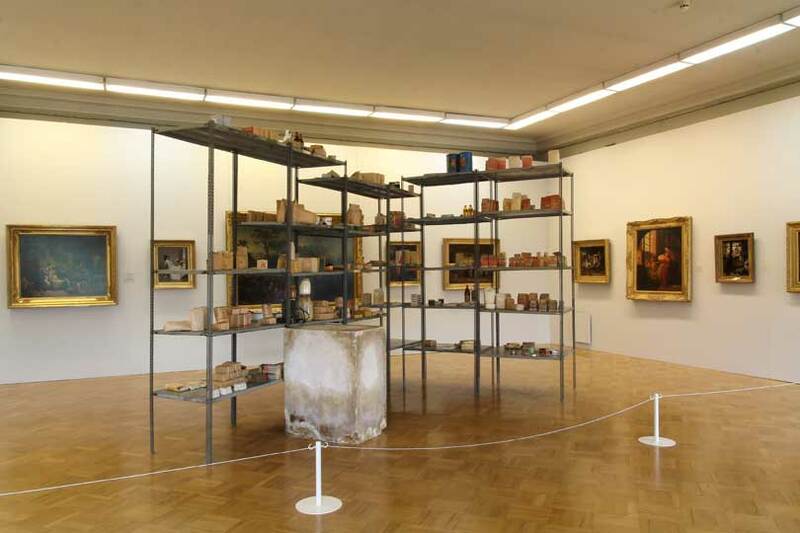 Joseph Beuys’s monumental 1980 installation Wirthschaftswerte (Economic Values), a series of shelves with foodstuffs and implements from East Germany, is resonantly displayed as the artist wished in a gallery of German paintings created between 1813 and 1883 – the life span of Karl Marx. But the biennial and its impact do not end there. The opening night’s party in the scruffy Sergey Kuryokhin Modern Art Center, a very different location from the grandiloquent Winter Palace, was just the start of a series of performances and exhibitions in a range of venues throughout the city, which will continue throughout the summer. 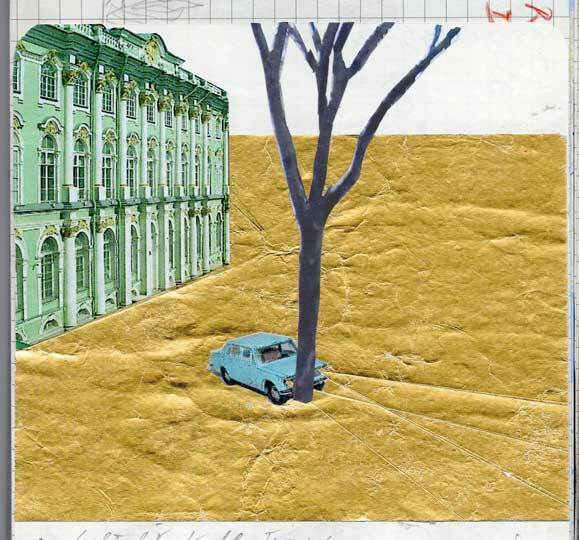 Here both foreign and Russian artists address more directly the history and politics of place. If you plan to go, do not miss Apartment Art as Domestic Resistance in a former communal flat near the Moscow Station, which manages to reflect underground artist life from the 1960s until today without toppling into nostalgia. Instead of reflecting back our own preconceptions, the temporary exhibition I saw here seemed an eagerly taken opportunity to make original work about history. While König describes his curatorial intervention as a ‘Manifesta without a Manifesto’, it is clear that Russia’s artists see the show’s presence here as far from neutral. ‘Manifesta 10’ is at the State Hermitage Museum, and other venues in St Petersburg, until 31 August. A few photographic highlights from ‘Lichtbilder’ at the Städel Museum in Frankfurt. The top picture is not of the Winter Palace. It shows the General Staff Building at night.